DEMAREST – Northern Valley/Demarest had a full head of steam heading into Sunday’s Bergen County Tournament’s Round of 16. Seeded fourth, the highest ever in their history, the Norsewomen are the product of a labor-intensive and patient approach to building a program from the bottom up. 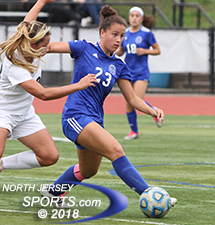 Demarest has a lot of good players, a lot of quality depth and another quality win under its belt after a 3-0 victory over 13th-seeded Paramus Catholic on Sunday afternoon. The win rights a wrong made by the schedule-making powers that be because after being left off of each other’s regular season schedules, Demarest and Old Tappan, the No. 5 seed, will meet next weekend in the quarterfinals in a 5:30 p.m. start at Indian Hills High school. Paramus Catholic keeper Kate Donnelly made 11 saves on a busy day in net. To get there, Demarest first had to deal with Paramus Catholic and the Norsewomen came out on the front foot. When Carly Sherman hustled home the game’s first goal to cap off a dominant opening eight minute stretch, it was looking like Demarest was going to be able to cruise into the quarterfinals. 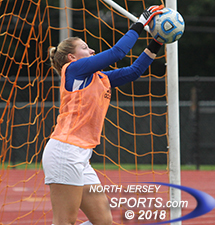 But rather than that early tally being the sign of a barrage to follow, Demarest was still clinging to just that single goal advantage as the clock ticked below 18 minutes in the second half. Paramus Catholic was hanging tough at the end of a trying week stocked with quality opposition. It was a long time between moments for Demarest, too, but some of its inability to extend its lead came down to bad luck. In the 30th minute, Sherman hit a left-footed rip from 20 yards out that struck the underside of the crossbar but bounced back into the field of play. The Norsewomen also lost standout senior Izzy Urquiola to an ankle injury for the later part of the first half and had to settle for the slim 1-0 lead at the break. Urquiola returned and promptly threatened by taking down a ball in a tight spot and rifling it into the outside side panel in the 49th minute. Victoria Constantine, one of three Demarest’s three freshman starters, sent Sherman through the channel in the 54th minute but the shot went just wide and Sherman also had two other quality looks, a volley over the bar in the 60th minute and a tricky one touch that chipped the keeper bounded softly past the right post. Senior Izzy Urquiola scored a goal and assisted on another for Demarest, which will play Old Tappan in the quarterfinals. Demarest finally gave itself some breathing room with a goal that was the direct result of some hard work. Urquiola saved a ball near the left touchline and kept it in play for Abby Rozen, who then found the feet of Constantine. Urquiola, who never stopped moving, was by then in the middle of the field and took a Constantine pass to the middle of the field where she cleared a defender and snapped a shot into the lower right with 17:42 remaining. Sherman got her well-deserved second goal in the 75th minute. She pounced onto a free ball that was created by her own pressure on a defender and deposited it into the goal for the 3-0 final score. Sherman, a sophomore who plays with speed and aggression, is a part of the infusion of talented underclassmen that has bolstered this senior class, which includes Urquiola, Emma Miller, Gabi Cammalleri, Alissa Gonzalez and Antonia Sames, who are all starters and important pieces. Miller, the goalkeeper who is in her third year as a varsity starter, supports a back line that includes two freshman outside backs in Grace Hamlin and Elizabeth Argenziano and junior central defender Kyra Pialtos. The defense limited Paramus Catholic to just one shot on goal. A fourth freshman, Emily Holzer, a striker that scored four goals in three varsity games before being sidelined by mononucleosis, will be another weapon when she returns. Getting to the county quarterfinals is special for Demarest, which has been there just one time prior.